Structuring Drama Work is the only drama resource that explores 100 dramatic conventions and techniques and provides ideas for how to practise them. 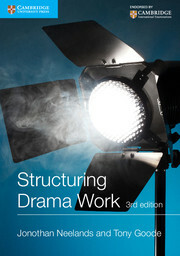 Structuring Drama Work explains dramatic conventions and what they do, explores how dramatic techniques can be used, provides cultural connections and global contexts and includes examples of the techniques in the context of the plays and the texts. Its compact size and simple format make it convenient and easy to use.Structuring Drama Work is suitable for teachers of Cambridge IGCSE®, GCSE and for students studying at A Level, IB Diploma and beyond. Structuring Drama Work will give inspiration and ideas to students and give teachers, and others, the confidence to plan and structure effective drama learning based on clear examples of each convention in place. Jonothan Neelands and Tony Goode are experienced and respected teachers and authors with a wealth of experience in the Drama and Theatre sphere. The simple format is ideal for teachers needing ideas and inspiration for lessons and for students needing guidance. This new edition contains 100 dramatic conventions with clear explanations of how they work in the context of a range of plays and their cultural connections. Acknowledgements, Introduction, Part 1: A guide to dramatic conventions, Section A: Context-building action, Circle of life, Circular drama, Collective character, Collective drawing, Commission, Defining space, Diaries, letters, journals, messages, First impressions, Games, Guided tour, Making maps and diagrams, Objects of character, Role-on-the-wall, Simulations, Soundtracking, Still-image, Theory building, The iceberg, The ripple, Unfinished materials, Section B: Narrative action, A day in the life, Critical events, Everywoman, Good angel/bad angel, Gossip circle, Hot-seating, Interviews and interrogations, Mantle of the expert, Meetings, Noises off, Overheard conversations, Reportage, Spotlighting, Tag role, Teacher-in-role, Telephone or radio conversation, Timeline, Time will tell, Will they, won't they?, Section C: Poetic action, Action narration, Alter-ego, Analogy, Behind the scene, Caption-making, Ceremony, Chamber theatre, Come on down!, Commedia dell'arte, Cross-cutting, Ducumentary, Flashback, Folk-forms, Forum-theatre, Genre switch, Gestus, Living newspaper, Masks, Mimed activity, Montage, Physical theatre, Play within a play, Prepared roles, Reader's theatre, Re-enactment, Reminiscence Theatre, Revue, Ritual, Role reversal, Shape-shifting, Small-group play-making, Soundscape, TV times, Verbatim theatre, Section D: Reflective action, Are you moved? Builders of bridges, Character box, Choral speak, Empathy knots, Finger ballet, Gestalt, Gifting, Giving witness, Group sculpture, Harmony, If I were you..., Marking the moment, Moment of truth, Narration, Postbox, Power line, Space between, Spectrum of difference, Taking sides, This way/that way, Thought shower, Thought-tracking, Voices in the head, Wall of China, Walls have ears, Window on the world, Part 2: Structuring drama for learning opportunities, Part 3: Theatre as a learning process.